The land that the garden occupies was added to Brooklyn Botanic Garden's property in the 1930s and was originally intended to showcase home gardening techniques. 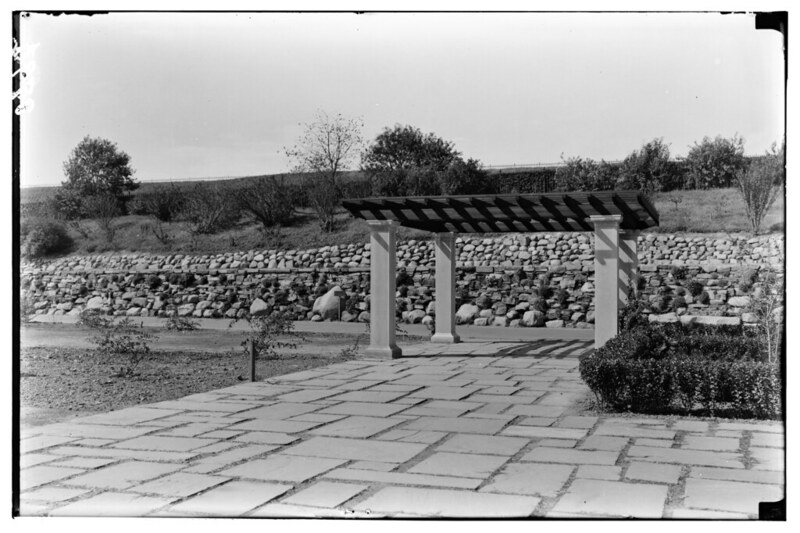 The garden was designed by landscape architect Harold Caparn and built in part with labor provided by the Civil Works Administration and the Works Progress Administration. It was dedicated by Garden donor Sade Elizabeth Osborne as a memorial to her husband, Dean Clay Osborne, in 1939. The symmetrical design is typical of formal European-style gardens, and the garden's stone features evoke the Art Moderne style popular at the time. 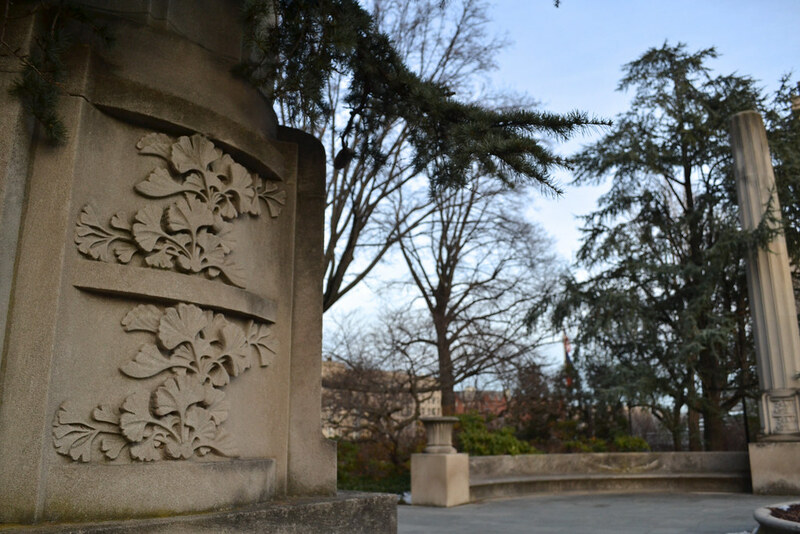 At the north end of the Osborne Garden is a pair of 35-foot-tall fluted stone columns designed by Caparn. Their bases feature reliefs of ginkgo leaves, which reference the ancient Roman fasces used in similar contexts to represent power. Here, however, Caparn instead used a botanical motif to symbolize peace. Next to the columns at either end of the garden are curved seats, informally called the whispering benches, which have acoustic properties that allow visitors on opposite sides to hear each other's whispers. A boulder wall planted with a variety of species runs along the west side of the garden, and an elevated path leads past to Fawcett Terrace, a small seating area overlooking the garden. Annual beds feature spring bulbs, and later, summer-blooming annuals. 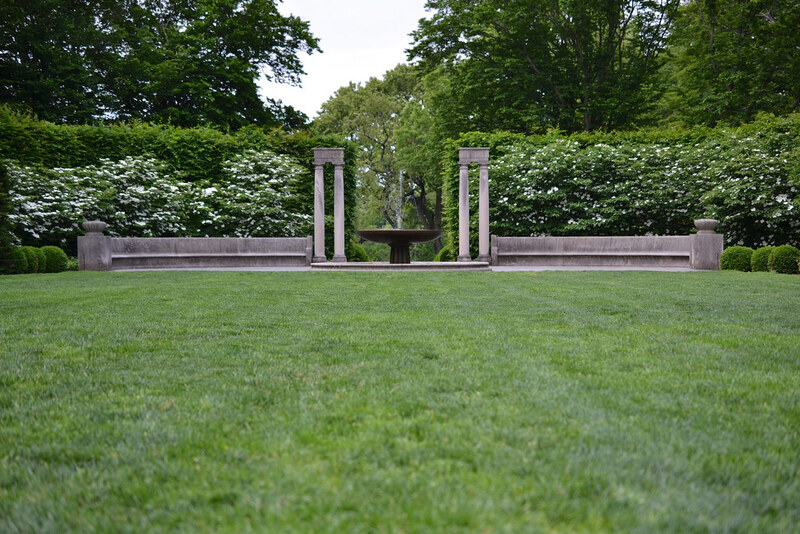 In 1947, noted landscape architect Alice Recknagel Ireys, also the designer of BBG's Fragrance Garden, incorporated plantings of bright-blossomed azaleas, wisterias, and evergreens to frame the central lawn. Another gift from Sade Osborne, the azalea display represented 1,200 specimens from the collection she had amassed in her own Brooklyn garden. Over time, the variety of plants in this garden has grown to include Japanese maples, dogwoods, and a beautifully manicured hornbeam hedge. At the south end of the Osborne Garden are curved benches framing a bluestone plaza. Fourteen-foot-high columns are modeled after those in Boboli Garden in Florence. A water basin more than 17 feet in diameter holds a fountain and bowl carved from a single piece of Indiana limestone. Photo by Morrigan McCarthy. Cedrus atlantica (atlas cedar) growing beside the columns in the Osborne Garden. Photo by Blanca Begert. 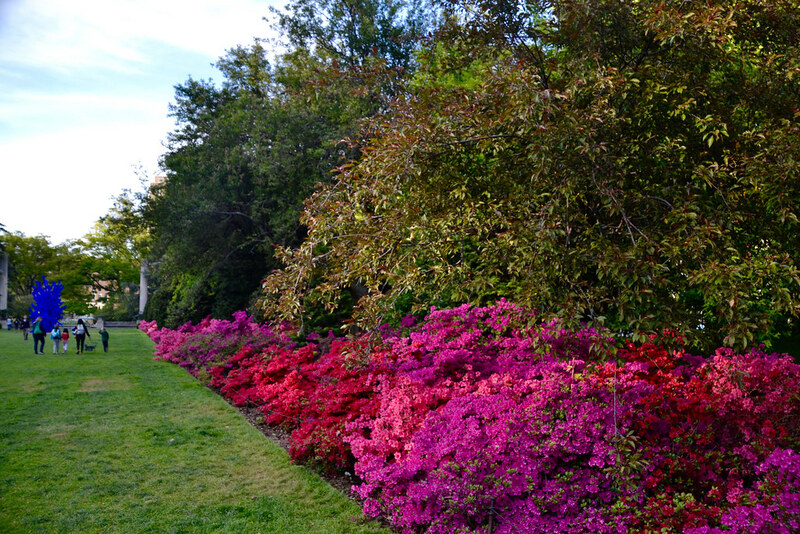 Azaleas are blooming in the Osborne Garden. Photo by Blanca Begert.